The Columbus Panhandles were a professional American football team based in Columbus, Ohio. The club was founded in 1901 by workers at the Panhandle shops of the Pennsylvania Railroads. They were originally a part of the Ohio League from 1904 before folding after one season. 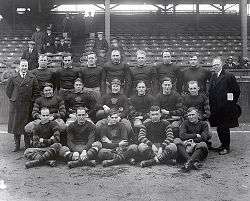 Three years later, the team tried again and playing the Ohio League from 1907 to 1919, not winning a championship, before becoming charter members of the National Football League (NFL)—firstly named American Professional Football Association (APFA). The Panhandles are credited with playing in the first NFL game against another NFL opponent. They have zero NFL championships, but Joseph Carr, the team's owner from 1907 to 1922, is enshrined in the Pro Football Hall of Fame for his work as NFL president. The earliest existence of the Panhandles was in 1900; the Columbus Press-Post reported Jack Walsh creating the "Panhandle railroad team" consisting of "big hardy railroad men." No other articles in 1900 were written about the Panhandles. A game was scheduled for October 19 of next year, however, no source provided an outcome. In 1901, managed by William Butler of the Ohio Medical University, the Panhandles played two games against the Columbus Barracks, a team consisting of local soldiers. The results were split; the first was a 2–6 loss while the second was a 12–6 win. Butler left the Panhandles for unknown reasons, and the new manager for the 1902 season was Harry Greenwood. Greenwood placed advertisements in every newspaper he could in order to schedule games against local opponents. His ad read "The Panhandle Athletic Club has organized a football team and would like to play any college, high school or manufacturing team on Saturday or Sunday." As a result, the Panhandles scheduled four games in 1902: three against the Columbus Barracks and one against the Dennison Panhandles, and finished with a 0–3–1 record. Once again, the Panhandles got a new manager for the 1903 season, E. E. Griest. Griest needed help with the team, so he hired Ben Chamberlain to coach the team. After an exhibition game against the Ohio State Buckeyes, the Panhandles won their first game of the season, a 38–0 victory over Neil Avenue Athletic Club. This victory gave the team some unexpected press; the Columbus Citizen wrote the first article praising the team. The Panhandles 1903 season ended with a 5–3 record. Joseph Carr directed the Panhandles in 1907 until 1922. In 1904, Joseph Carr, who was a sports writer for the Ohio State Journal and manager of the railroad's baseball team the Famous Panhandle White Sox, first took over the football team. However the Panhandles didn’t take off and the team played just two games. Carr tried again three years later in 1907. Carr saw the potential for professional football not only to be a great spectator sport but also to become a successful business venture and envisioned pro football being just as popular as Major League Baseball. One of the first things Carr did when he became the owner of the Panhandles was to exploit one the railroad's policies. Since most of the team's players were employed by the railroad, they could ride the train free of charge. Because of this perk, Carr was able to schedule mostly road games, eliminating the expenses of stadium rental, game promotion, and security for the field. However, while the team did play the majority of their games on the road as a traveling team, their home games were played at Indianola Park. The Panhandles adopted an amateur sandlot mentality for their playing style. Since the team was composed mainly of railroad workers, the scenario gave the players limited time to practice and prepare for games. The Panhandles did the majority of their preparation during their lunch breaks. Workers had a one-hour break during a normal workday, and the players on the team usually took the first 15 minutes to eat lunch and used the remaining 45 minutes to practice football. An athletic field behind the railroad shops in Columbus became the team's practice field. The Columbus Panhandles playing a game during the 1910s at Indianola Park. However Carr knew that if his team was to succeed, he needed an attraction. Carr built his team around pro football's most famous family the Nesser Brothers, who were already drawing crowds throughout the country. Carr used the seven Nesser brothers as the backbone of the Panhandles, and the football-playing family remained in that role for nearly twenty years. None of the Nessers attended college, despite many offers. The seven Nesser brothers, who worked as boilermakers for the Pennsylvania Railroad, were exceptionally large and strong for people living in the early 20th century. Frank Nesser was 6-foot 1-inch tall and weighed 235 pounds. They all were exceptionally great athletes for their time. Carr took out ads describing his Panhandles as the toughest professional team in football, led by the famous Nesser brothers. In 1921 the Panhandles line-up included player-coach Ted Nesser and his son Charlie. It was the only time in NFL history a father and son played together on the same team. The Nesser brothers nephew, Ted Hopkins and brother-in-law, John Schneider, also played on the team. The Panhandles' rosters did not include many former college players or All-Americans, so the athletic field in the railroad yards was the place where the team found out who could play. The team's "dirty" reputation was learned and developed on the railroad yards, not in college stadiums. The press sometimes criticized the Panhandles for their rough play; however, the fans who paid the gate money to attend the games loved it. The 1915 Columbus Panhandles team. Over a span of twenty years, the Panhandles were considered the best pro team in the city of Columbus. The team compiled a 33–5 record against opponents from Columbus, including a 32–1 record over their last thirty-three games. The Panhandles were the best professional football team to ever come out of the capital city. Between 1914 and 1916, which were seen as best years of the franchise, the Nesser-led team went a combined 22–10–1. The majority of the early pro teams would go out of their way to schedule the Panhandles, as they knew it would be easy to advertise a game featuring the famous Nessers. In 1915, The Panhandles were rumored to have played against the legendary Knute Rockne six times in 1915. According to the team, each time they played Rockne, he was on a different team. This rumor, however, is false; Rockne was too much of a family man to play that much pro football, and Notre Dame had most of its home games during the pro football season. On August 20, 1920, a meeting attended by representatives of four Ohio League teams—the Canton Bulldogs, the Cleveland Tigers, the Dayton Triangles, and the Akron Pros—was held. At the meeting, the representatives tentatively agreed to introduce a salary cap for the teams, not to sign college players nor players under contract with another team, and became united as the American Professional Football Conference. They then contacted other major professional teams and invited them to a meeting for September 17. At the meeting in September, held at Ralph Hay's Hupmobile showroom, representatives of the Rock Island Independents, the Muncie Flyers, the Decatur Staleys, the Racine Cardinals, the Massillon Tigers, the Chicago Cardinals, the Rochester Jeffersons, and the Hammond Pros were present. The following was achieved: the name of American Professional Football Association was chosen; officers of the league were elected with Jim Thorpe as president; a membership fee of $100 was set; a committee to draft a constitution was named; the secretary of the league was to receive a list of all players used during the season by January 1, 1921; and the trophy that would be awarded to the league champions. During this time, the Panhandles were admitted into the league. The Panhandles may have played in the first game with two APFA opponents. However, due to not having the games start at a standardized time, and the failure of the NFL of recording the start times, historians can not determine for sure which two teams played in the first league match-up. What is known for a fact is that the first contests between teams listed as APFA members occurred on October 3, 1920. On that date, the Panhandles were defeated by the Dayton Triangles, 14–0, at Triangle Park, and the Rock Island Independents beat the Muncie Flyers, 45–0, in Rock Island. Frank Bacon of the Panhandles is credited with the first punt return for a touchdown. Following the 1921 season, Carr became the league's new president and renamed the AFPA, the NFL. He then discontinued the Panhandles after the 1922 season because of cost and salary demands. Following the 1922 season, the Panhandles became the Columbus Tigers. In 1923, the Tigers attained their best ranking in the NFL, finishing eighth. During that season multiple players won awards. Rookie end Gus Tebell, who was also the coach, was awarded 1st Team All NFL by the Canton Daily News as well as the Green Bay Press-Gazette. Gus Sonnenberg, Paul Goebel, John Sack, and Bob Rapp were all awarded 1st Team all NFL by the Canton Daily News. Pete Stinchbomb was awarded 2nd Team All NFL by the Collyers Eye Mag. The next season, they finished tenth. Boni Petcoff was awarded 1st Team All NFL by the Green Bay Gazette-Press. Boni Petcoff and Paul Goebel were both awarded 2nd Team All NFL by the Green Bay Press-Gazzette, with the latter being awarded 2nd Team All NFL by the Collyers Eye Mag as well. Then, the Tigers ended their final two seasons twentieth and nineteenth, respectively. ↑ "Carr Bio". Football Hall of Fame. Retrieved July 27, 2013. ↑ "The Coming Game: Popular Football". Columbus Press-Post. September 23, 1900. 1 2 Willis (2007), p. 7. 1 2 Willis (2007), p. 9. ↑ "Panhandle Eleven A Strong Aggregation". Columbus Citizen. October 17, 1903. ↑ "Indianola Park, 1910s". Indianola Park. Retrieved December 27, 2011. 1 2 Hunter, Bob (January 27, 2002). "Forgotten NFL Family: The Nesser Brothers of Columbus, Ohio". Columbus Dispatch. ↑ "Frank Nesser". National Football League. Retrieved December 27, 2011. ↑ "Thorpe Made President" (PDF). The New York Times. September 19, 1920. ↑ "Organize Pro Gridders; Choose Thorpe, Prexy". The Milwaukee Journal. September 19, 1920. p. 24. ↑ "Columbus Tigers Team Encyclopedia". Pro-Football-Reference.com. Sports Reference. Retrieved December 26, 2011. 1 2 "1923 Columbus Tigers Statistics & Players". Pro-Football-Reference.com. Sports Reference. Retrieved December 26, 2011. 1 2 3 "1923 NFL All-Pros". Pro-Football-Reference.com. Sports Reference. Retrieved December 27, 2011. 1 2 "1924 Columbus Tigers Statistics & Players". Pro-Football-Reference.com. Sports Reference. Retrieved December 26, 2011. ↑ "1924 NFL All-Pros". Pro-Football-Reference.com. Sports Reference. Retrieved December 26, 2011. 1 2 "1925 Columbus Tigers Statistics & Players". Pro-Football-Reference.com. Sports Reference. Retrieved December 26, 2011. 1 2 "1926 Columbus Tigers Statistics & Players". Pro-Football-Reference.com. Sports Reference. Retrieved December 26, 2011. ↑ "Joe Carr". Pro Football Hall of Fame. Retrieved December 26, 2011. ↑ "1910 Columbus Panhandles". The Pro Football Archives. Maher Sports Media. Retrieved December 26, 2011. ↑ "1911 Columbus Panhandles". The Pro Football Archives. Maher Sports Media. Archived from the original on September 5, 2008. Retrieved May 27, 2014. ↑ "1912 Columbus Panhandles". The Pro Football Archives. Maher Sports Media. Retrieved December 26, 2011. ↑ "1913 Columbus Panhandles". The Pro Football Archives. Maher Sports Media. Retrieved December 26, 2011. ↑ "1914 Columbus Panhandles". The Pro Football Archives. Maher Sports Media. Retrieved December 26, 2011. ↑ "1915 Columbus Panhandles". The Pro Football Archives. Maher Sports Media. Retrieved December 26, 2011. ↑ "1916 Columbus Panhandles". The Pro Football Archives. Maher Sports Media. Retrieved December 26, 2011. ↑ "1917 Columbus Panhandles". The Pro Football Archives. Maher Sports Media. Retrieved December 26, 2011. ↑ "1918 Columbus Panhandles". The Pro Football Archives. Maher Sports Media. Retrieved December 26, 2011. ↑ "1919 Columbus Panhandles". The Pro Football Archives. Maher Sports Media. Retrieved December 26, 2011. ↑ "1920 Columbus Panhandles Statistics & Players". Pro-Football-Reference.com. Sports Reference. Retrieved December 26, 2011. ↑ "1921 Columbus Panhandles Statistics & Players". Pro-Football-Reference.com. Sports Reference. Retrieved December 26, 2011. ↑ "1922 Columbus Panhandles Statistics & Players". Pro-Football-Reference.com. Sports Reference. Retrieved December 26, 2011. Braunwart, Bob; Carroll, Bob (1979). "The Panhandles: Last of the Sandlotters" (PDF). The Coffin Corner. Professional Football Researchers Association. 1 (8). Braunwart, Bob; Carroll, Bob (1981). "The First NFL Game(s)" (PDF). The Coffin Corner. Professional Football Researchers Association. 3 (2). Archived from the original (PDF) on March 1, 2012. Carroll, Bob (1982). "Akron Pros 1920" (PDF). The Coffin Corner. Professional Football Researchers Association. 4 (12). Archived from the original (PDF) on March 2, 2012. Klosiinkski, Emil (2006). Pro Football in the Days of Rockne. Panoply Publications. ISBN 978-1-886571-14-3. PFRA Research (1980). "Happy Birthday NFL?" (PDF). The Coffin Corner. Professional Football Researchers Association. 2 (8). Archived from the original (PDF) on March 1, 2012. Siwoff, Seymour; Zimmber, Jon; Marini, Matt (2010). The Official NFL Record and Fact Book 2010. National Football League. ISBN 978-1-60320-833-8. Willis, Chris (2003). "Joe Car's Vision" (PDF). The Coffin Corner. Professional Football Researchers Association. 25 (5). Archived from the original (PDF) on December 15, 2010. Willis, Chris (2007). The Columbus Panhandles: A Complete History of Pro Football's Toughest Team, 1900–1922. Lanham, Maryland: Scarecrow Press. ISBN 978-0-8108-5893-0. OCLC 71244032. Willis, Chris (2010). 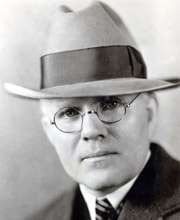 The Man who Built the National Football League: Joe F. Carr. Lanham, Maryland: Scarecrow Press. ISBN 978-0-8108-7669-9. Wikimedia Commons has media related to Columbus Panhandles.